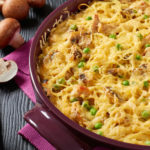 If you are looking for a fantastic recipe to use up that leftover turkey then this Instant Pot Turkey Tetrazzini recipe is for you! Okay, who are we kidding, we make this delicious comfort food meal even when it isn’t right after Thanksgiving. It is that good! 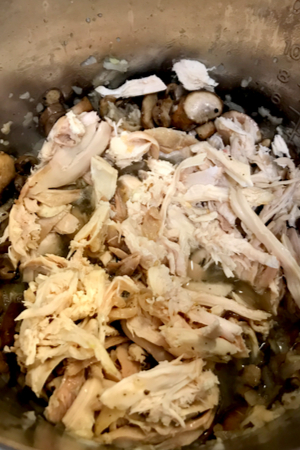 Instant Pot Turkey Tetrazzini – a great recipe to use leftover turkey. Turkey tetrazzini actually was a substitute recipe for the original recipe of Chicken Tetrazzini. In the early 1900’s a San Francisco hotel chef created this dish to impress an opera singer. It was a casserole that consisted of spaghetti, mushrooms and chicken in a creamy white sauce and topped with cheese. It is a crowd pleasing dish that was granted the last name of the Soprano singer, Tetrazzini. 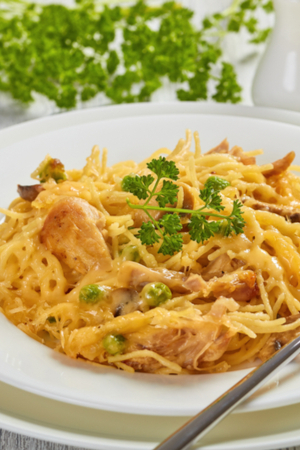 Over the years, this famous chicken dish provided the inspiration for Turkey Tetrazzini. Which makes total sense. 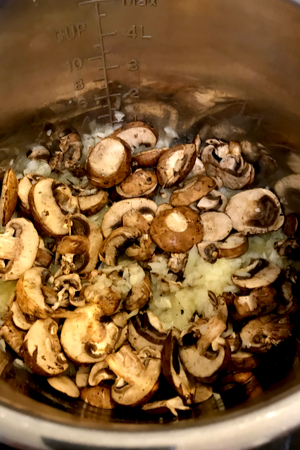 The first step is to saute your onions and mushrooms, right in the liner of your Instant Pot. Cooked chicken and turkey are virtually interchangeable in many recipes. This is especially true when it comes to casseroles. Casseroles can be made with almost any ingredient. From pasta dishes to rice combinations, they are almost always consider a comfort food meal. However, they typically take a while to bake in the oven. That is why I decided to make Instant Pot Turkey Tetrazzini. I wanted the same delicious recipe, but in a fraction of the time. Add your turkey and stir before adding the noodles. When it comes to making turkey tetrazzini there are a few things that typically require to be precooked. Of course, the shredded turkey that is added has already been cooked. That is why this makes a great recipe for leftover Thanksgiving turkey. 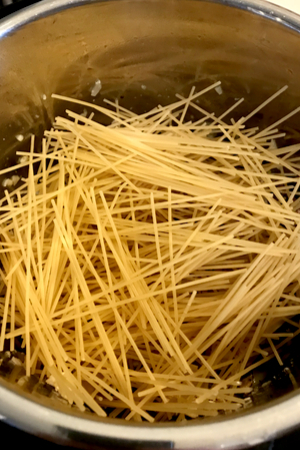 But traditional baking recipes also require the spaghetti noodles to be cooked before being added to the casserole. The most important part of this recipe – spread the noodles out in a crisscross pattern before cooking. 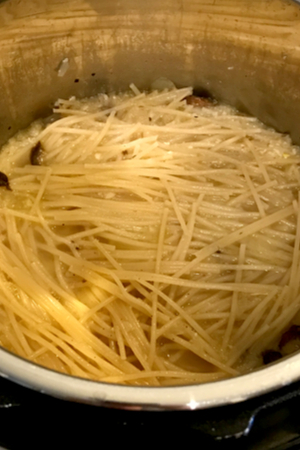 So when I decided to make Instant Pot Turkey Tetrazzini instead of the baked version, I knew that I could save some time. First of all, I decided that I would cook the noodles with the rest of the ingredients directly in the Instant Pot. Not only will that save me time, but that is one less pot that I have to clean! The first steps of this recipe require you to saute onions and mushrooms. The important thing to remember is that you add the butter AFTER your Instant Pot display reads HOT. Once the cooking time expires, perform a quick pressure release and find that your noodles are cooked perfectly. If you add the butter when the pot is cold, you increase the risk of the ingredients sticking to the bottom of the pot. There have been questions whether or not it is safe to use alcohol in the Instant Pot. Because the pressure cooking function is a closed cooking system, the alcohol is trapped inside and unable to be cooked off. 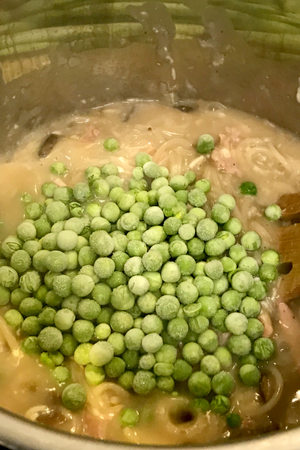 Frozen peas are optional, however they compliment the Instant Pot Turkey Tetrazzini recipe perfectly! However, this recipe calls for the white wine to be sautéed before being pressure cooked. This cooking method allows adequate time for the alcohol to burn off. And one last hint for the perfectly cooked Instant Pot Turkey Tetrazzini. When adding your spaghetti noodles be sure to break them in half. Then scatter them in the pot in a crisscross pattern so that they cook evenly. The liquid will not come above the top layer of noodles. Just press them down lightly and be sure to NOT STIR the noodles. 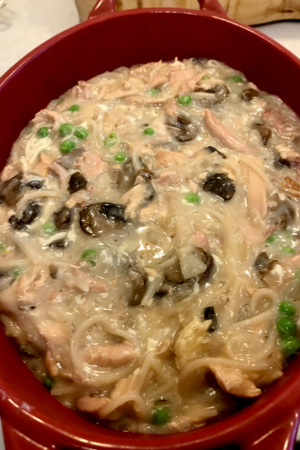 Creamy and delicious Instant Pot Turkey Tetrazzini. Trust me, they will cook perfectly using this method. Depending on the type of noodles that you are using, you may need to adjust the cooking time. Look at the recommended cooking time on the back of your noodle package. Take the lowest recommended cooking time and cut that in half. That will be the amount of pressure cooking time required for this recipe. For example, if your noodles say to boil for 8-10 minutes, your cook time will be 4 minutes. 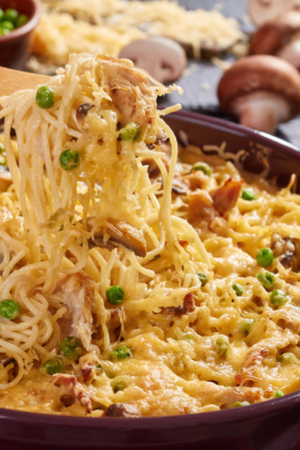 Traditional turkey tetrazzini is topped with Parmesan cheese and browned in the oven. It is totally up to you if you want to crisp the top of your Instant Pot Turkey Tetrazzini casserole. 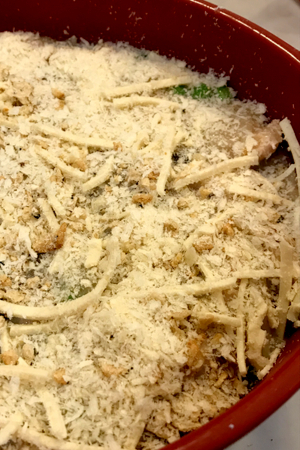 Instant Pot Turkey Tetrazzini in a casserole dish and topped with cheese and breadcrumbs. It is a delicious casserole without the topping. However, I prefer a little extra cheese and the added crunch of Panko bread crumbs on top of my dish. I just pour the contents of the Instant Pot into a large casserole dish. Sprinkle on the cheese and breadcrumbs and heat it until the cheese is melted and the breadcrumbs are browned. So if you are looking for a delicious leftover turkey recipe to make in your Instant Pot, look no further! Instant Pot Turkey Tetrazzini being served. Creamy turkey and pasta dish that uses leftover turkey as it’s main ingredient and is a true comfort food that everyone craves! Place the Instant Pot on Sauté mode. When the display reads HOT add the butter. Once melted add onions and mushrooms and sauté for 4 minutes. Add garlic and sauté for one minute. Pour in the wine and allow it to cook with the mixture for several minutes, deglazing the bottom of the pot if necessary. Add the leftover/cooked turkey to the pot and stir. Hit the Cancel Button. Add the noodles that are broken in half and place in a random, crisscross pattern. Then pour the broth over top of the noodles. Do not stir, however, push the noodles down into the liquid as much as you can. Secure the lid and place the valve to the sealing position. Pressure Cook/Manual on High for 4 minutes. Once the cooking time expires, perform a controlled quick release of pressure. Slowly release the pressure so that liquid doesn’t squirt out the top of the valve. Mix flour with 1/2 cup of water and whisk until smooth. Stir in with the noodles to thicken the sauce. Press OFF and add the pieces of cream cheese and monterey jack cheese and stir as it begins to melt. Stir in the peas. Stir to combine, adding salt, pepper, and cayenne pepper as needed. Transfer the mixture into a large baking dish and sprinkle the top with Parmesan cheese and Panko crumbs. Broil uncovered for 3-4 minutes or until the cheese is bubbly and the crumbs are golden brown. This was excellent. I did cheat and used cream of mushroom soup instead of flour and mushrooms as I didn’t have either. I also put it in my Ninja Foodi so I could broil it right in the pot. It’s okay to cheat 🙂 Glad it worked out and so happy that you loved it!